Yu Jianhua is a professor from Shanghai International Studies University, where he also worked as the director of the Institute of Foreign Literature Studies. 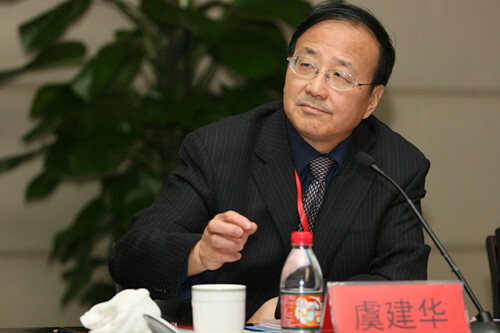 Also a member of the executive council of the China Association for the Study of American Literature, he once won the honorary title of “Nationally Exemplary Teacher.” He has published several academic works on foreign literature, particularly American literature, and has translated some works, including the novel Timequake by Kurt Vonnegut. When describing A Companion to American Literature, one might use words like “heavy” or “dense,” but that would be an understatement. An encyclopedia of American literature, it features a total of nearly 2,100 entries, including writers, critics, literary theorists, works, journals, organizations, schools, movements, events and awards of America. The first encyclopedia of foreign literature from a particular country that has been compiled by Chinese academia, it covers not only works of serious literature but also influential popular literature. To learn more about this encyclopedia and how it serves China-US cultural exchanges, a Wenhui Daily reporter interviewed its editor-in-chief Yu Jianhua. Wenhui Daily: With the participation and support of 26 Chinese universities in compiling the encyclopedia, it took you as long as 10 years to finish the compilation work. Could you talk about what motivated you to publish such a 3.5 million-word encyclopedia? Yu Jianhua: The significance of the encyclopedia can be seen from the three keywords in its title—companion, American, literature. First, the encyclopedia is about America, a country that has been unique since its birth. America’s recorded history dates back to the discovery of the New World, which was then followed by immigration and settlement. It was this diversity of races from different global regions that constituted the new nation, established on a type of melting-pot culture. Since World War II—especially since the end of the Cold War—America has thrived in many sectors, including the field of literature. American literature, reflecting its other national strengths, leads the global trend and stands on the frontier. American writers, from the beginning of the country’s birth, have participated in writing its national history. They serve as the window through which we understand America and its political practice, social life, values, customs to grasp the most direct and genuine exotic cultural experience. Before this encyclopedia was published, there was a void in Chinese academia in terms of a sufficiently comprehensive reference book—except for some piecemeal books—to serve as the tool for comprehensively studying American literature. I once published an encyclopedia about American writers and their works in 2004, but I found that a systematic, comprehensive, cutting-edged and authoritative reference book on American literature was still needed to adapt to the domestic situation in China, where the translations of American literature are brimming with enthusiasm. I believe that literature is the best cultural medium. With the deepening of globalization, the mutual infiltration and influence between China and the US through literary dialogue and communication will be increasingly frequent. Therefore, the compilation of A Companion to American Literature is intended to serve university students, cultural scholars and common readers as well as to help foster US-China cultural communication. Wenhui Daily: An encyclopedia would be naturally considered an authority and a standard. There seems to be different translations of foreign writers’ names and the titles of their books. How did you deal with such inconsistency during your compilation of the encyclopedia and did you make any attempts to standardize those different translations? Yu Jianhua: You are right. For an encyclopedia, the job of standardization is important. Apart from writers’ names and books’ titles, the titles of American newspapers, journals and literary awards also face the problem of inconsistent translations. Take the National Book Awards, one of the three major American literary awards as an example. There are different versions of its translation, and it is hard to say which is better. Therefore, our compilation team conducted an investigation and statistical analysis of these translations so that the relatively better version could be chosen. Wenhui Daily: You mentioned the principle of “keeping our own culture as the base and making use of that of others” in compiling the encyclopedia. Could you offer any examples? The thread of keeping our own culture as the base and making use of that of others runs through the whole process of entry selection and work review in compiling the encyclopedia. Take the entry on Howard Fast, the American novelist, for an example. This left-wing writer had acutely condemned the American social system that engendered hierarchical polarization and wealth inequality. For this reason, he is seldom mentioned in the works of literary history compiled by Americans. But the case is different in China. Many of his works were translated into Chinese. A Companion to American Literature also includes a profile of Fast. Regardless of whether a writer is liked, he or she constitutes part of the history and contributes to the evolution of cultural phenomena in a special historical context—this is also what makes such writers a necessary part of China-US literary interaction. I have read some of the works by Fast, and I found them quite sentimentally delicate and moving. They are not only of political import but also aesthetic value. But the post-Cold War mainstream American literature excluded him in a blunt way, whereas in 2003, many years after the Cold War had ended, the New York Times hailed him as the “Hero of America.” Therefore, it can be seen that the mainstream American literary value does change sometimes. The entries in the A Companion to American Literature are written to meet the readers’ demands. The entries include those American works that are usually adopted by Chinese university textbooks and those that are familiar to most Chinese readers, such as Hemingway’s novel The Snows of Kilimanjaro, O Henry’s novel The Last Leaf, the poems Because I could not Stop for Death by Dickinson and Stopping by Woods on a Snowy Evening by Frost, which, short as they are, are often quoted and widely relished in China. Such works are thus what this encyclopedia was made for. Another example is that, considering the fact that the prize-winning information in the field of literature is usually followed with interest, the encyclopedia lists respectively the prize-winning authors and their works as well as the years when they were awarded for the convenience of readers’ reference. In addition, since the encyclopedia compilation was undertaken by more than one person, the unification of its style, format, and translation terms also took plenty of arduous efforts. This is where I took heed in editing the encyclopedia and thus feel deeply about it. Wenhui Daily: The first wave of Chinese immigration to America started in the mid-19th century and has lasted about two centuries up until the present day. The immigrants brought a distinctive historical and cultural impression, the tradition and memory of which has continuously influenced the way of living and literary writing style in the land. What do you think of the cultural collision and integration demonstrated in Chinese-American literature between the two countries? Yu Jianhua: As you mentioned, Chinese-American literature attracts people’s attention. The majority of early Chinese immigrants to America were laborers who were largely illiterate. This was different from the first generation of American Jewish immigrations, a considerable proportion of whom were intellectuals who recorded the cultural clash that they experienced firsthand by creating autobiographical novels. The writings about Chinese traditional culture that could be found in Chinese-American literature mainly came from the descendants of these immigrants. The source materials of these recordings were thus second-hand, which stemmed from the descendants’ memories about the older generations and the living style they inherited from their predecessors’ past. Take the most famed Chinese-American writers Amy Tan and Maxine Hong Kingston for example. Born and raised in America, they received an American education and recognized American values. However, affected by their family backgrounds and identities as ethnic minorities, they encountered the problem of cultural conflict and cultural identity. To voice the themes of cultural conflict, they chose literary expressions, and by this means, they ascended to the status of mainstream writers. Since the 1970s, post-colonialism, with its emphasis on the coexistence of diversified cultures and equitable dialogues between these cultures, has become one of the foremost literary subjects. The emergence of post-colonial literary study thus justified the writings about cultural conflicts that ethnic minorities encountered, providing the “politically correct” chance for these Chinese-American writers, whose works have been incorporated into university textbooks and adapted into films, to have a great impact in America and also China with large amounts of literary lovers for such works spawned. Therefore, the encyclopedia A Companion to American Literature makes the Chinese-American writers one of its main focuses.